Companhia Brasileira de Offshore (CBO) has chosen Cobham SATCOM VSAT and Satellite TV (TVRO) antennas in addition to radio communication equipment for installation on six new Offshore Support Vessels (OSV). CBO’s state-of-the-art new OSVs have been commissioned to fulfil development contracts offshore Brazil and will be entering service during 2017 and 2018. 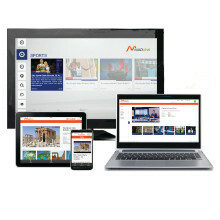 Global shipping company United Arab Shipping (UASC) has installedXChange Media, Marlink’s news, entertainment and television solution on 44 of its vessels to provide on-demand multi-lingual content for crew via their personal devices.